UrBanPerspectiV BLOG: Shut Up or Play It !! 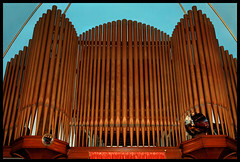 This is a genuine pipe organ. This one is located at Mt. Tabor A.M.E. Church in Philadelphia. The good reverend Martha A Lang, pastor, informed me that they have it tuned quarterly. Wow this is beautiful and must sound heavenly. All I have to say is...wow! Nice photos, your sister sent me. Happy Vgno!